The creature feature subgenre of Horror has always fascinated and terrified me, specifically, the aquatic monsters featured in movies like Creature from the Black Lagoon, Jaws, Piranha, and many more. The thought of being attacked from beneath, unable to scream, run, or even hear your attacker coming, gives me nightmares. I feel safe and secure swimming at the lake that surrounds my family cabin, but to this day, I’m more than a little edgy going into the ocean. In 1999, television writer David E. Kelly and Director Steve Miner teamed up to release Lake Placid, which works as both a modern day take on creature feature concept and a witty homage to B-movie cinema. In the film, Paleontologist Kelly Scott (Bridget Fonda) is reluctantly sent to Black Lake, Maine to assist in the investigation of a Fish and Game officer who was bitten in half by an unseen creature from beneath the water. Once there, she joins local Sheriff Hank Keough (Brendan Gleeson) and Fish and Game Officer Jack Wells (Bill Pullman). They’re an odd crew to say the least, and tempers flare even more when egotistical Professor of Mythology Hector Cyr (Oliver Platt) joins the search for the mysterious creature. After a series of lethal encounters, including an overturned canoe, a severed toe, and the decapitation death of one of their crew, the team discovers that the creature they’re dealing with is a prehistoric 30-foot crocodile. And as it turns out, foul-mouthed lake resident Delores Bickerman (Betty White) knows more than she initially let on about this killer croc’s origins and feeding habits. As the bodies pile up, the team has to find a way to capture or kill this ancient behemoth to assure that the local community can be safe once more. As always, I hesitate to say too much more about the plot of Lake Placid and let you enjoy this fun film for yourselves. Believe it or not, the main draw of the film (and repeat watch factor) is the witty and creative dialogue from screenwriter David E. Kelly. The dialogue is consistently fresh and playful, and the humor is very dark and fitting. Lake Placid plays more like a tribute or homage to the B-movie creature features of yesteryear than a straight horror film, but offers plenty of unique kills and bloodshed for those that require it. The characters are extremely well written, and in turn, creatively played by the cast involved, which is something unique for a film of this genre. 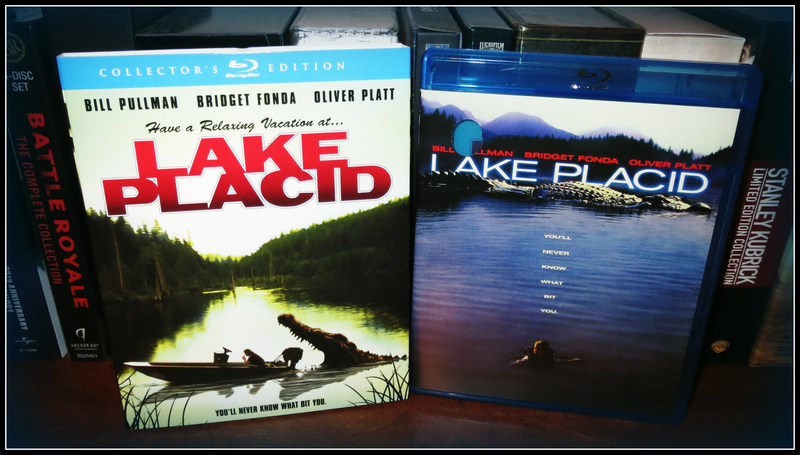 I really enjoyed revisiting Lake Placid after all these years, and it’s the perfect summer entertainment for horror fans. 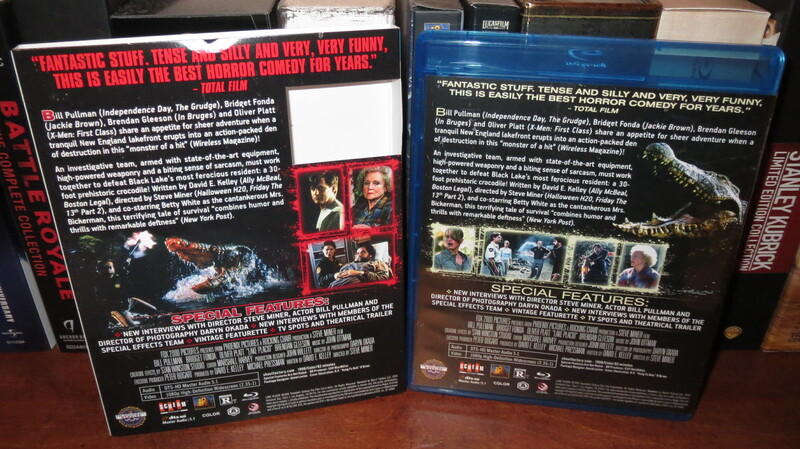 Fans of Lake Placid can rest assured that the film looks great in High Definition. Some of Scream Factory’s abundant admirers seemed worried that this transfer might be plagued with some of the picture quality issues that their most recent license from Fox (Ravenous) displayed. There is no reason for concern here, and point of fact, this is a strong video presentation. Film grain looks natural and authentic, and textures and fine object detail in clothing, crocodile scales, and the surrounding woods of the lake is very clear. Colors are also accurately reproduced here, with the golden-hued and forest green color scheme really coming to life. There are no signs of digital noise reduction, and the print is relatively free of artifacts or scratches, making for a fantastic video presentation. The 5.1 DTS-HD Master Audio track featured here represents the film well on Blu-Ray. Dialogue, music, and sound effects are all equally balanced across your home entertainment system in a surprisingly dynamic presentation. From the larger scale action scenes (crocodile chomps, boat motors, helicopter blades) to the films quieter moments (birds chirping, crickets on the lake), this audio presentation is respectful to the source and enhances this fun B-movie for home viewing. The Making of Lake Placid– This brand new HD documentary runs over thirty minutes and features interviews with the likes of Actor Bill Pullman, Director Steve Miner, Editor Marshall Harvey, Cinematographer Daryn Okada, and many more. The cast and crew discuss David Kelly’s witty script, the blend of animatronics and CGI used to bring the crocodile to life, the enormous water tank used in production, Betty White’s time on the set, and other fun details from filming. I especially enjoyed the story that Nick Marra (effects supervisor) told about the grizzly bear being scared of the animatronic crocodile. This is another standout job from Scream Factory and crew. Theatrical Trailer- The original theatrical trailer is presented in standard definition and runs just under two minutes. This is a classic 90’s preview, with the “smoky” tone voiceover and recycled climactic music from Aliens, and offered theatrical audiences a good taste of the humor and mayhem from the film. Featurette- This featurette includes what appears to be carried over interview footage from the previous Fox DVD release that has been edited together with film footage from the new high definition transfer. It runs a little over five minutes, and is presented in standard definition. TV Spots- Roughly a minute and a half of television promos for Lake Placid that ran during the original theatrical campaign for the film. Like the aforementioned trailer, these little clips help establish the fun and campy nature of the film. Croc Test Footage- This is over seven minutes of camcorder footage (no audio) from the filming during the summer of 1998. Just a few test shots from the animatronic designers to make sure the mouth, nostrils, and eyes were working on the crocodile. Behind the Scenes Gallery- Over five minutes of fun behind-the-scenes photos and production stills from the making of the film. I especially enjoyed seeing the various camera rigs and mechanical elements used to make the crocodile come to life. As you can see from the “Unboxing” pictures below, this Blu-Ray release from Scream Factory includes newly commissioned artwork from artist Robert O’Brien. I love the postcard style utilized here, and really appreciate the minimalist approach that really evokes terror. It’s clean, simple, and uncluttered. On the reverse of the slipcover you’ll find a plot synopsis, production stills, a list of special features, and the technical specifications for this release. On the inside of the packaging, you’ll find the Blu-Ray disc with some nice artwork, and a reversible slip-sheet featuring the original theatrical poster design for the film. Very well done! 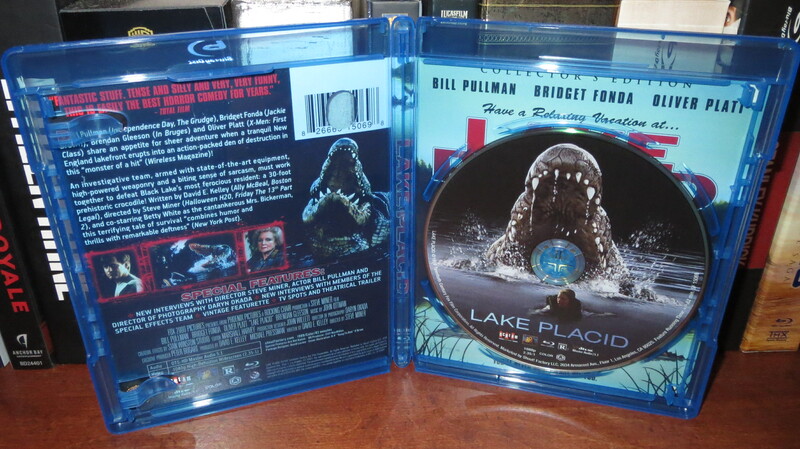 If you’re like me, and “creature feature” horror is your thing, you’ll get a kick out of Lake Placid. This self-aware B movie homage is well written, funny, and offers up more than a few “light” scares. It’s a shame that most of the subgenre films today are relegated to television films, because Lake Placid demonstrates how you can make a fun, campy, big-budget creature feature that is a hit with audiences and (most) critics alike. The Blu-Ray edition from Scream Factory features an outstanding video presentation with authentic film grain and natural colors, and an audio presentation with a surprisingly dynamic range. Special Features are top notch as well here, especially the brand new documentary made for this release. All in all, this might just be my favorite release from Scream Factory’s “Summer of Fear” thus far. Lake Placid comes Highly Recommended. This entry was posted on June 27, 2014 by doctormacabre. It was filed under Blu-Ray Reviews, Uncategorized and was tagged with 20th century fox, b movie, betty white, bill pullman, black lake, blu-ray review, blu-ray unboxing, brendan gleeson, bridget fonda, campy, creature classics, creature feature, dark humor, david e. kelly, doctor macabre, doctor macabre's laboratory, film fan pete, homage, horror blu-ray, july blu-ray releases, lake monsters, lake placid, maine, oliver platt, prehistoric crocodiles, river monsters, saltwater crocodile, scream factory, shout factory, steve miner, summer of fear, top ten horror movie monsters.